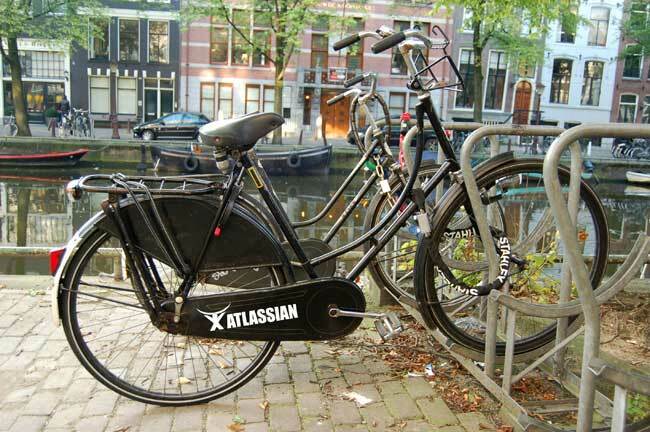 The new Limited Edition Atlassian Old Dutch bicycle seen on the canals of Amsterdam this week. Opening a new office in our business is a special moment. It’s that chance to relive a start-up and the Primal Basics. Atlassian B.V. is official. 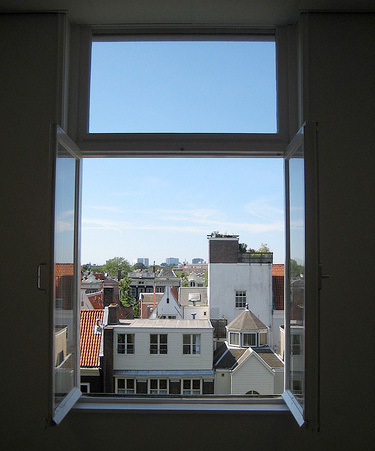 We have leased an incredible new office on the Herengracht (Gentlemen’s canal) in Amsterdam. Just last year I snapped a picture of Herengracht the day of our first Amsterdam User Group a few meters from the pic above, in front of Atlassian’s new European headquarters. Why this office? We’re here because European customers, who represent 35% of our business have been asking us for support and more direct access. We’re in the Netherlands because we found it to be a good tech community, centrally located in Europe, with outstanding language skills. Amazingly the Netherlands is our 6th largest country in sales. 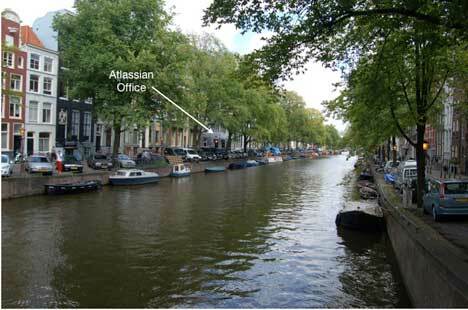 Just down from Leliegracht, the new Atlassian location. … we’re hiring in Amsterdam right now. Here’s a complete view of the new office, the neighborhood, and our time last week setting things up. We’re lucky to have two employees already in Amsterdam. Joshua Wold, who runs our worldwide team of sales engineers moved to the Netherlands, and in addition to screwing together new furniture and hooking up phones, he’s eager to meet folks in the local community. To head up our European technical support team, Sherali Karimov, one of our senior developers and team leads in Sydney has agreed to relocate. Just Friday he arrived with his family ready for a new adventure in Amsterdam. These mates are looking for some great technical support engineers, sales engineers, someone to head up our European channel business, and a customer service specialist who can also help out with the office administration. We love referrals. Josh and Sherali are looking for people who want to build the next great Atlassian office and chart a new path in Europe. We’re looking for people who love building things from scratch. You might have to screw your desk together, but then, it’s your desk! This entry was posted in Atlassian and tagged Atlassian Amsterdam Recruiting Europe. Bookmark the permalink. Martin — Had dinner with Olivier A and Eva in Paris 2 weeks ago. Should have pinged you, dude. I owe you a beer in Amsterdam with a big sticker on the side. We are looking actually for a consultant who has knowledge to implement and provide rules/recommendations/… a Corporate Wiki based on Confluence product. Do you have people in Ansterdam who can do this ? Welcome to Amsterdam, thanks for interviewing you at Web expo Berlin. Economic has struck world.Mans should be more vigilant. Work makes man could provide for mans.Solution: Radiowalker: Tech Business Beat. great stuff guys, hope you succeed in Amsterdam!